Students attending the xFair this Monday checked out many companies, as well as projects made by their peers. Andy Trattner ’17 and a team of students launched a mental health platform, Lean On Me, Tuesday. Students will be able to use the platform by texting a hotline to receive support from peers. The team includes Trattner as CEO, COO Linda Jing ’17, CTO Amin Manna ’17, and Board Member and MIT alumnus Nikhil Buduma ’15. A proposal to change the housemaster title is currently under discussion by housemasters and students alike. 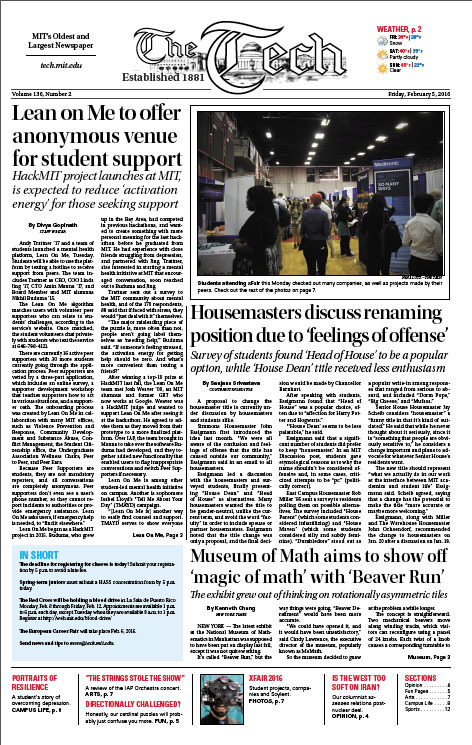 From ongoing research and new publications, to awards, events, and initiatives, there is no shortage of news on MIT’s campus. Between start-ups, student life, classes, and competitions, how should we judge what to report on, and what to leave aside? NEW YORK — The latest exhibit at the National Museum of Mathematics in Manhattan was supposed to have been put on display last fall, except it was not quite working.